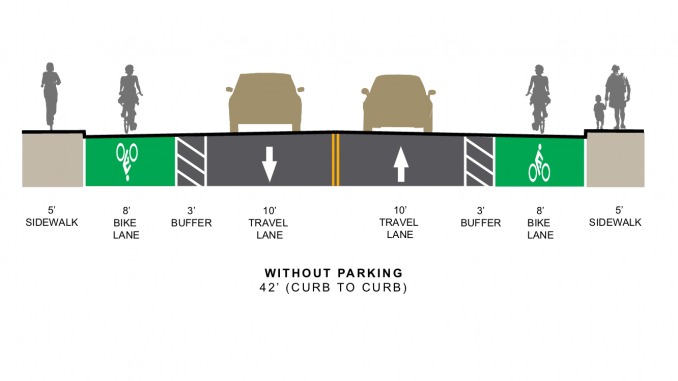 If the bike lane proposal receives City Council approval, here's what Middle Avenue would look like. 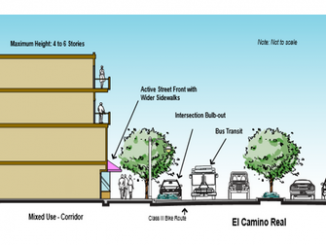 This illustration is from a report prepared Richard F. Angulo, assistant city engineer. 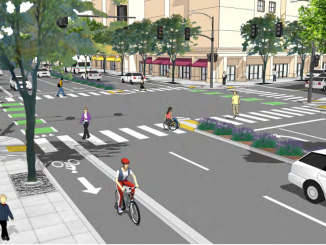 The Menlo Park Complete Streets Commission last night (April 10) recommended eliminating parking along parts of Santa Cruz Avenue and Middle Avenue in order to add bike lanes. The proposals will ultimately have to be approved by City Council over the summer. A total of 135 parking spaces would be replaced with bike lanes in hopes of making the roads safer for children biking to Oak Knoll Elementary and Hillview Middle School. Responses from residents along Middle were mixed. Some, such as Doug Alberger, said the elimination of parking would be “detrimental” to his quality of living, because he and his wife only have room for one car on their driveway, and their gardener would not be able to park in front of their home. But others, such as Bernard and Susan Traverset and Brandon Visser, said they’re fine with the removal of parking if that means children can get to school safely. Middle Avenue residents also asked the commission to look into ways to get drivers to slow down on their street. Just 17 parking spaces would be replaced with bike lanes and sidewalk along the stretch of Santa Cruz between Avy Avenue and Olive Street.